A sure sign of spring, T.J. is back at his usual spot slinging hotdogs (dawgs). He now has a swanky new house, and same great dawgs. I like how T.J. Dawg House, is now a house instead of a cart; the name is just more authentic now. The sausage has some nice spice, although I personally would like it a little spicier. The grilled peppers and onions provide a nice sweet contrast to the spices in the sausage. The Vienna Beef “Dawgs” will continue to be the star of the show at TJ’s Dawg House, but for a change of pace this sausage hits the spot. Formerly of home depot fame, the Hot-Dog Guy, has returned. His new home is a cart adjacent to Best Buy in Williston Vermont. 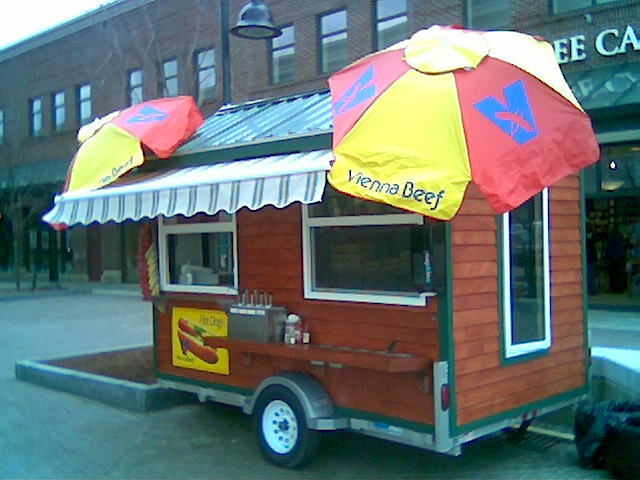 He is now slinging Chicago’s famous Vienna Beef dogs, 1/4 LB hot-dogs that is! 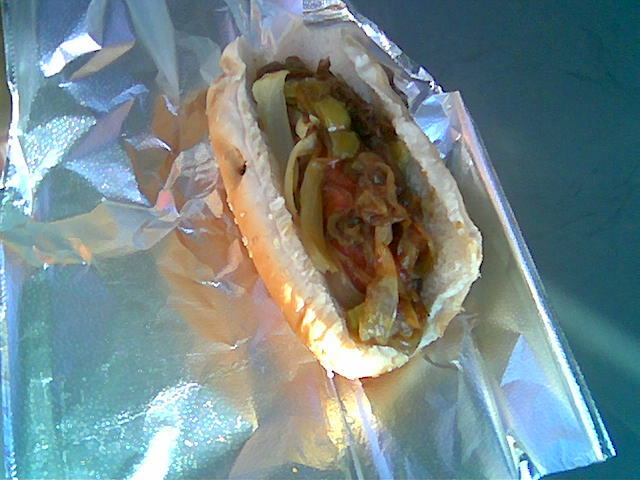 He also has the standard Vienna Beef accoutrement of relish, jalapenos, sliced fresh tomatoes, and onions. Options that cost a little extra are sour kraut, chili, and cheese. I opted for the kraut, jalapenos, tomato, mustard and ketchup combo. The bun is a nice seeded, warmed bun. 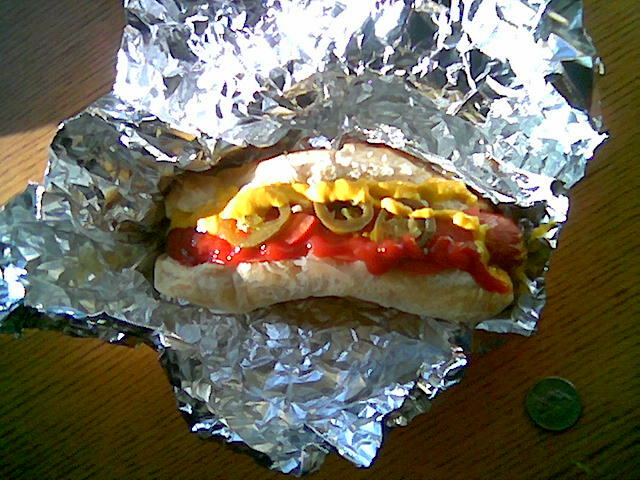 Vienna Beef, is a new hot-dog to me, and it’s delicious. Subtle spices in the meat and the addition of some new toppings makes this a novel twist on classic Americana. At $2.50 for a plain 1/4 hot-dog, these are a great value.